What is the difference between the MP4 and AVI video options? MP4 is the default video format, and should work well with all modern devices, including smartphones, tablets etc. It gives high quality video for a relatively small file size. The only downside is that some older computers may not be able to play it directly without installing an alternative video player, or codec set. We recommend using the free VLC media player, available here. The AVI format option encodes video using an older Widows video format (MSMPEG4v2). This produces a larger file which is not quite as good quality as MP4, however it will work on all Windows computers without installing any extra software. We only recommend using this format if you are having trouble with the MP4 version, or you would like to ensure that someone using a Windows computer can play the video without installing additional software. Try to see if any error message is displayed - this could often be something like "missing codec". This could mean that some video decoding software (codec) needs to be installed before the video will play. You may find various "codec packs" on the web that offer support for various audio and video formats. While they may work, it's not usually necessary to install an entire pack of codecs just for MP4 video support. Instead, you can download and install the DivX H.264 codec. An alternative to installing a codec is to use a video player like VLC player which has support for different video codecs built in to it. If you're trying to play a HD video on an older smartphone, please be aware that some of the very early versions of Android and some older phones may not support directly playing back HD video. In this case, you could either download from Glitterboo at a lower resolution, or upload the video to somewhere like YouTube or Vimeo in order to stream it from there. If you have an nVidia graphics card in your computer, there is a potential issue which can make colors in videos played back through Videolan look washed out. See the page here for more details and how to fix it. Also, VLC player will typically default to resizing video that's larger than your screen. This can sometimes make the video look slightly less sharp as it is scaled down. You can see the original quality by unchecking the "Always Fit Window" option under the "Video" menu. Some sites (and apps) will lower the video playback quality if they detect that you are on a slower connection. This can especially be a problem with some wireless or mobile net connections. If you think this might be happening, try watching your video from somewhere with a good Internet connection. On YouTube, you may need to change the video quality setting (from the gear-wheel icon) to a higher setting. On Facebook, if you have uploaded a video with resolution of 480p or higher, you might need to press the "HD" button (or gear-wheel icon "1080p" settings for example) to see the HD version of it. Note: For many places where you can upload video, including Facebook, the HD version of the video may not be immediately available after uploading, it may take a few minutes before you can view the HD version. If you want to retain the best quality video when uploading on different sites, we suggest using the MP4 video option on Glitterboo downloaded at the highest 1080p resolution whenever possible. How can I get my videos to autoplay on Facebook? Facebook auto-play is where a video posted on a timeline in Facebook starts playing automatically once it comes into view (i.e. when you scroll or swipe down the page to view it). Facebook don't provide exact details of how this works, however from our test, it seems to work for most videos. If you're wondering why a certain video clip isn't auto-playing, it's probably because you've already watched it through at least once already. Auto-play doesn't automatically start the sound in the video, you need to click on the speaker icon to enable it after playback starts. What is the 768p video resolution? HD video usually comes in one of two versions, 720p HD and 1080p FullHD (newer standards like 2k and 4k are also becoming available). HD pixel resolutions are usually 1280x720 for 720p, and 1920x1080 for 1080p, when used in movie/film terminology. However, computer screens have many other "HD like" resolutions (such as 1366x768), so for the sake of simplicity, we're considering anything 720p or higher as "HD", even though the aspect ratio may not necessarily be 16:9. If you're uploading a photo or image to Glitterboo with the intention of adding it to a larger HD video clip, it should first be edited so that it's using the correct resolution/16:9 aspect ratio. How does the soundtrack option work? The soundtrack feature lets you upload a standard audio file to use as a soundtrack for the animated video. This is especially nice for making videos to put on YouTube or share with friends on Facebook etc. The audio can be in any of the following formats; MP3,M4A,WMA,WAV,AIFF,FLAC and up to 10 minutes long. The video length is then automatically adjusted to the length of the audio. If you upload an audio track longer than 10 minutes, the video will be clipped to 10 minutes (it will fade out the audio just before the end). The audio file is also stored on Glitterboo so you can re-use it the next time without uploading again (occasionally it may be necessary to clear uploaded audio tracks for maintenance purposes). The soundtrack feature is available to paid members. The max. audio file upload size is 100MB. Where can I find audio files to use as a soundtrack? This depends on what kind of video you're making. You might try thinking about the type of theme that your photo or image suggests, and search for music or soundtracks around that theme. For example, if you used Glitterboo to add sparkling effects to the sea of a holiday pic, you could search for music or sounds about the sea, beaches, tropical islands etc. YouTube Audio Library - songs can be added to YouTube videos after uploading to YouTube, or can also be downloaded to use separately as a Glitterboo soundtrack for example. Free Music Archive - offers a range of music under different types of Creative Commons license (i.e. all tracks should be ok for personal use, but some may have commerical usage restrictions). Jamendo - offers many tracks that are mostly free for personal use. They charge a small fee for commercial usage, check the licensing details on each track's page for more information. Free Stock Music - has a selection of entirely free music tracks in different categories. They are associated with another paid audio service called Audioblocks, however the tracks on the top half of the site (above "More Results from AudioBlocks.com") don't require payment. Note that Facebook and YouTube may not allow video uploads that contain copyrighted music as a soundtrack. On YouTube, you can check whether your soundtrack will be blocked in advance by searching using the track and artist name under the "Ad-supported music" tab on this page. This appears to be an excellent option to use for personal, artistic/fan created or non-commercial videos, since it gives you the opportunity to use commerical music tracks in videos uploaded to YouTube, while it may also help support the artists that created those tracks (to some extent). 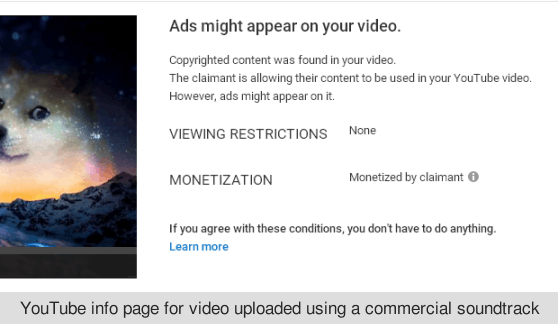 Note however that we can't advise you on the full legal aspects of using commercial music in your video - ultimately the copyright still belongs to the rights holder, so it's possible that they could request such a video be taken down, and this system doesn't apply to videos hosted outside of YouTube. See YouTube's page on Free and Ad-Supported music for more details on their policies. YouTube Audio Library doesn't supply any commercial music tracks itself so you will need to use your own music files as a soundtrack. Facebook may send you an overly-ominous sounding message instead when it detects a commercial track is being used. They are far less flexible than YouTube in this regard - we suggest not uploading videos to Facebook directly if you think they might contain a copyright audio track. You may be able to add a commercial track to a YouTube video and then share the link on Facebook instead. This appears to be a legitimate way around this restriction, since the videos remain hosted on YouTube. Another option is to simply use ambient or background noise as the soundtrack. Again you can try searching by theme, mood or keywords. Freesound.org holds a huge selection of audio tracks for download. Although many of these are short clips, it also has longer tracks of background sounds. All audio files are free to use and are well tagged, so it's usually quite easy to find something. YouTube Audio Libray also has a separate category for sound effects and ambient sounds. Another possibiltity is to record your own greeting or message using the Sound Recorder application on your computer, or an app on a phone or tablet (see here for more details). After recording a message, it should let you save it in one of the common audio file formats. Then you can just upload this file to Glitterboo as the audio track. This is a nice idea if you want to create a video as an e-greeting or video message. How can I clear the soundtrack file? If you upload a new soundtrack file, it will replace the existing one. You can also clear the current soundtrack file from your account settings page. Note that we can't guarantee that uploaded soundtrack files will remain available on an ongoing basis, it's simply a convenience feature and soundtrack files may occasionally need to be re-uploaded. We don't support this right now, however you can individually create some short video clips using a different image each time, and then combine them using video editing software. How can I add titles or text to a video? At the moment, you would need to add any text etc. to the image first before uploading to Glitterboo. What are the exact video encoding specs? Baseline profile for lower resolution videos (less than 720p), otherwise Main profile. H.264 level is dependent on resolution. Should play on older Windows computers without additional software or video players needed, going back to at least Windows XP.